If you're looking for an easy dessert that screams HOLIDAYS, this is it! I found this recipe on the back of a bag of fresh cranberries and immediately set it aside. I cut it out, and stuck it to my fridge with a magnet for a year until I was ready to try it. Well, I finally tried it! OMG, it's seriously delicious. The cake is dense but light, and it's so moist, I'd say this is one for the books. Add a few fresh cranberries and an orange glaze and you have the makings of a showstopper! TBH, the cake was supposed to bake in a 9x13 pan, and the recipe said nothing of a glaze. But I like how a Bundt looks, and I love a rich and creamy glaze drizzled over the top, so I went with it! At first I couldn't decide if this was more of a Thanksgiving thing or a Christmas thing, but basically decided that it's great for both! Yes, it's red and white and looks very Christmasy, but Thanksgiving is the official holiday season kickoff, right? So, it works there too! Regardless of when you decide to make it, or in what pan you decide to bake it, one thing is absolutely certain.. Everyone will love it! Definitely add this one to your holiday repertoire! Beat the eggs and sugar until slightly thickened and the mixture has almost doubled in size, about 5-7 minutes. Add softened butter and vanilla extract and mix for 2 more minutes. Stir in the flour until just combined. Add the rinsed cranberries and stir until mixed throughout. Spread into greased and floured Bundt pan. Bake 50-60 minutes or until lightly browned and an inserted toothpick comes out clean. Let cool almost completely in the pan before turning out onto a plate. Using a wire whisk, combine all glaze ingredients until smooth. Add more heavy cream if needed to make just the right drizzling consistency. I like to use a big spoon to scoop big blobs of the glaze across the top and then just let it ooze down the sides. Yup. blobs and ooze. definitely culinary terms. 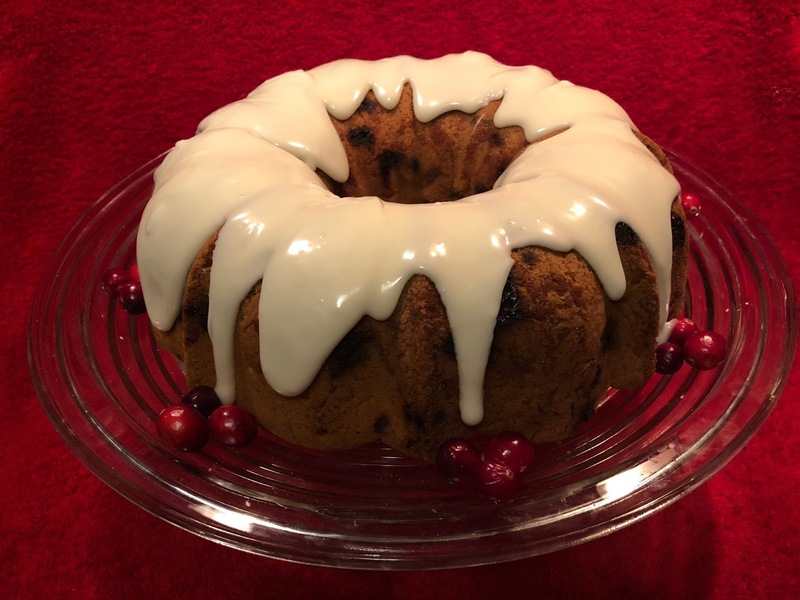 -To keep your cranberries from sinking to the bottom of the cake, take a 1/4 cup of the flour for the recipe, and toss the cranberries with it until they're coated. Then stir them into the batter as directed. The flour coating will help them stay suspended in the cake! -I think the next time I make this, maybe I'll add a little almond extract. Just sayin! -If you'd like to bake it in a 9x13 pan, you only need to bake it for 40-50 minutes. And instead of the glaze, you could use any other favorite icing (cream cheese icing maybe?) or just simply dust with powdered sugar. -Oh, another thing that's worth noting.. Yes, you read the ingredients correctly. This recipe has no leavening agent in it. No baking soda, no baking powder, no vinegar or lemon juice, no ingredient that will make the cake rise (which is why it comes out so dense and fabulous). It's that first step of whipping the eggs and sugar the gives rise to the cake. Make sure you don't skip it! !